“…Lovely watching the elegant yellow Tug negotiate said twisties with precious cargo aboard, while squids launch themselves over guardrails failing at same test. This I will never forget….” George B. My husband grew up on a cattle ranch in the sand hills of Northeast Nebraska, where they grow their own corn, soy, and alfalfa to feed their cattle. 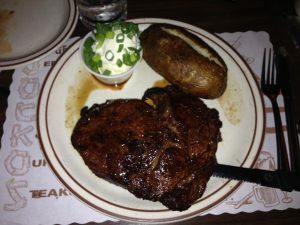 He states that the best steak he has ever had is at Jocko’s Steak House in Nipomo, CA. 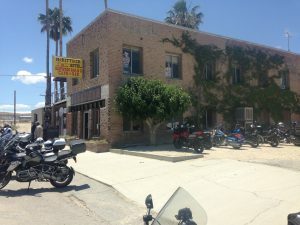 Our motorcycle club, LABikers, tries to get up to Jocko’s once a year, and we make a 2 day trip out of it. 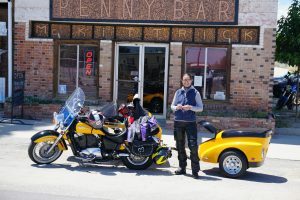 Our group motto just happens to be ride, eat, repeat, and this trip would not disappoint. Another reason this trip was important is that we needed to “practice” with the kids to make sure all or our systems were in place and worked. We had the iPad, books, camera, new apps on the phone and iPad, and our new helmet communicators. We also needed to test out the comfort factor of the rig for all of us. This would be the first of two weekends in a row that the kids would be in the sidecar for long periods of time. We were putting the kids (and me) through sidecar bootcamp! We all met at Cactus Patch restaurant in Moorpark for breakfast. Good food and good company. For most of our friends it was the first time they saw the sidecar. Once all the tire kicking was over we hit the road. I would always be the slowest, so I took off knowing they would catch up. The quick details: Balcom Canyon, S. Mountain Rd, the 150, the 33 into Ojai for a gas stop, then continued on the 33 over the mountain, into the valley going north past Taft. Our lunch stop was the McKittrick Hotel and Penny Bar. This is one of those iconic, out of the way but totally worth the drive diners, with a bar in the back where everything is covered in pennies. The place was packed and those ladies were hopping to get all the orders out. Lots of good food and great stories where shared by all. Time to get moving! We hit the 58, did a quick loop on the 229, then eventually got on the 101 to head south to Nipomo. We made great time, so we had the chance to hit the pool and hot tub at the hotel before dinner, since or reservation was not until 7:30pm. Once again Jocko’s did not disappoint. THE MOST delicious steak! Huge portions! Every belly was happy. (Today’s ride was eat, ride, eat, ride, eat again. Whew!) 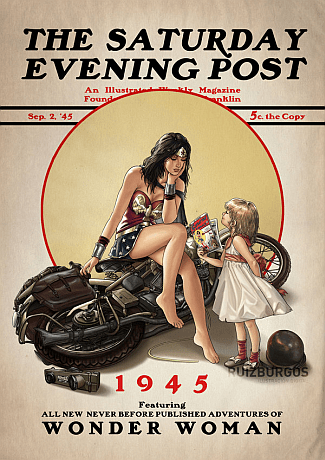 I did most of the sidecar piloting, and Frank gave me a couple of breaks. It is definitely more fatiguing than riding my other bike and riding the twisties is quite an upper body workout. We have come to recognize that the sidecar needs to be strongly persuaded to turn and go where you want it to go. Frank also comments, “it makes going straight interesting”. 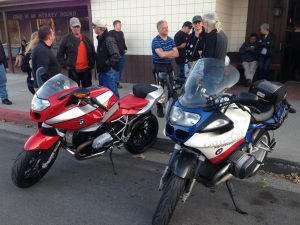 Sunday morning we met at the IHOP, where we spend part of the breakfast geeking out on our Sena helmet communicators. Frank and I and the Kids all have communicators and have been practicing talking to each other and making sure we have music, or the kids can watch a movie on the iPad. So at breakfast we make more intercom group menus so we can talk to the other riders in our group that have Sena’s. Sena has a phone app for that, and it takes some time to get it all worked out. After breakfast we head south again on the 101, then the 166 east to get back to the 33. We get to share the road with a lot of other bikers and a group of immaculate Lamborghini’s. I pulled over a few times to let people pass, and learned that if I really get on the brakes on the side of the road in those small turn outs, the whole rig will slide. So that is a little disconcerting. It is pretty heavy with the trailer full of weight. But now I know. While we are stopped at a vista point to rest and take pictures, some of our group witness a bike go into a corner too hot and go over the edge. The rider is OK, but the bike is totaled. As always the LaBikers are there to help out and tend to the rider with some minor first aid. His friend goes on ahead to reach an area with cell service and get a tow truck. At this point, some of us plan on going our separate ways once we get to Ojai, so we say our goodbyes, and hit the road. 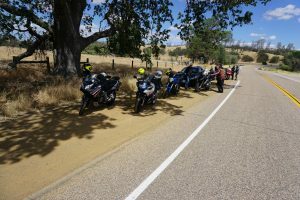 A small group of us grab lunch in Ojai, then slab it back to LA on the freeway and PCH. Two days of wonderful weather, fabulous food, and great friends. Next weekend we have Sierra Rally, and yet another weekend of sidecar bootcamp!